»The History Of Sreevallabha Temple In Kerala Will Surprise You! The History Of Sreevallabha Temple In Kerala Will Surprise You! There is no doubt that India has always been a land of temples. Ever since its inception, the concept of religious sites and temples has always been in existence. But did you ever try to find out about the oldest temple in the country? Even though the exact dates of the ancient temples in India are unknown, they are said to have been constructed before the early Medieval Period of India. But do you know there is a temple in Kerala which dates back to the period before the Common Era and has been proved as the oldest-known temple? Located in a city called Thiruvalla, Sreevallabha Temple is believed to be the oldest-known temple in the country. You would be surprised to know about its history of survival and existence. Let's move ahead and learn everything about this ancient beauty and how to reach it. The region in and around the temple experiences a moderate type of climate and hence it is a year-round destination. However, if you are looking forward to avoiding the summer heat of Thiruvalla, then the best time to visit it is from October until the end of February. As per historical records and ancient legends, Sreevallabha Temple at Thiruvalla is the oldest-known temple in the country today. It is said to have been established in 2998 BCE when the region was inhabited by a few tribal groups. However, the temple has gone through several renovations over a period of time. The current building of the temple was constructed a few centuries ago. It is dedicated to Lord Sreevallabha, who is said to be a form of Lord Vishnu and represents the cosmic man and is one of the 108 divya desams in the world. As per locals, the deity placed inside the temple was worshipped by Goddess Lakshmi and Lord Krishna themselves in 59 BCE. Therefore, it is a site of great historical as well as religious significance and is frequented by millions of Hindu devotees and seasonal tourists every year. 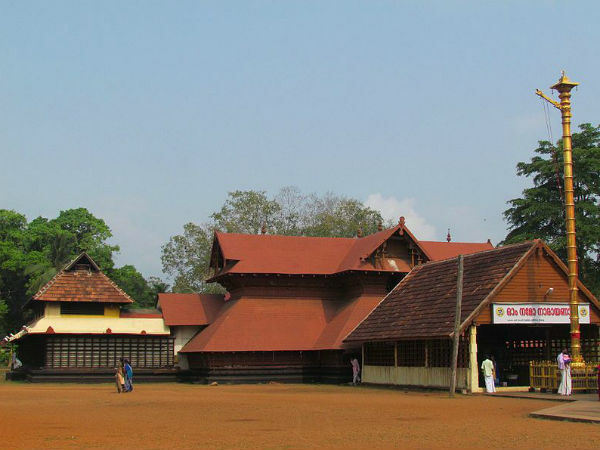 Sreevallabha is one of the largest temple complexes in Kerala and is spread over several acres. It is located on the outskirts of Thiruvalla in the vicinity of Manimala river. There is a small tank named Jalavanthi Theertham inside the temple compound and is believed to have been used by several great sages in the past. Therefore, it is considered a sacred tank. Did you know that women were banned from entering this temple until the ban was lifted in the year 1968 by the Indian government? Yes, when several incidents of women achieving salvation inside the temple were noticed, ladies got more attracted to the temple. Numerous incidents of ladies coming to the temple and marrying the lord were recorded. As a result of all this, the priests of the temple had to ban women from entering the sanctum sanctorum of the temple. Wouldn't you love to witness such an amazing temple which has a history stretching back to thousands of years? Apart from learning about the historical and religious significance of the temple, you can also indulge in framing the architectural beauty of the temple. Ranging from wooden carvings to wall paintings, each and every bit of the temple deserves to be scrutinised. By Air: The nearest airport to Sreevallabha Temple at Thiruvalla is located in Kochi at a distance of about 110 km. From the airport, you can either hire a direct cab or use public transport to reach the temple. By Rail: Thiruvalla has a railway station of its own. Hence, you can catch a direct train from other major cities and towns to Thiruvalla. The temple is located at a distance of about 3 km from Thiruvalla railway station. By Road: Thiruvalla has a good road network and can be easily approached by road.